Building an author platform today is a vastly different process than for authors in the past. Kristen Lamb’s Rise of the Machines can help you create a solid platform in today’s shifting digital world. Even as a child of the digital age, figuring out how to build my brand online can be confusing, especially when it seems like there’s always a new social media platform being created. Kristen Lamb’s Rise of the Machines can guide you in creating your writing brand no matter which platforms you decide to use. Lamb has a rare ability to touch upon the more abstract concepts involved with building your brand while grounding them in practical advice for how to use social media and your blog. Although Lamb does provide tips for the most common social media platforms, her advice can be applied to any platform. Rise of the Machines emphasizes the importance of creating a conversation online, and not simply throwing information at people and hoping someone will find it interesting. One section of the book is dedicated to separate advice for fiction and non-fiction authors to follow, as certain strategies are likely to work for one but not necessarily the other. One of the takeaways I got from this book was that it is okay to expand the topics I blog about and share on social media. Although it’s okay to blog about books and writing, that doesn’t need to be everything that I write about. Yes, I’m a writer, but I have other interests outside of writing, and it’s okay to share those online. Even though you are a writer, you don’t necessarily need to target every post at the writing population. Unless you strictly create works for writers (such as non-fiction books on writing craft), you don’t want to forget about the large segment of your potential audience that doesn’t wirite. Thus, it can be helpful to expand your content to reflect your other interests and let your 3D personality shine through in your online bios. Lamb’s guide provides plenty of food for thought for rethinking and building a solid author platform. 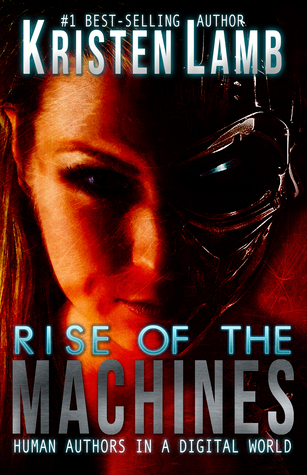 Rise of the Machines is available on Amazon in both paperback and eBook format. What books or resources have been influential in changing the way you think about your author platform? Nice piece, Zed. I am particularly interested in your view concerning blogging about other topics than writing. My blog is new, but the idea of talking about other things has crossed my mind. I don’t have a large following, so i don’t want to alienate anyone, but i also don’t want to frighten off the few followers i have gained! Thanks Steve! This is also something I’ve also thought a lot about since I read Rise of the Machines. I think there are a few different ways to go about this. If your blog already has a theme, such as writing advice, I think it’s okay to blog about other topics as long as you strike a balance between posts that match your theme and other kinds of posts. I also think it could work to have a themed post every week – for example, if you normally blogged about writing advice, you could have Thursday’s posts dedicated to blogging about another one of your interests. Rise of the Machines also talks about taking your posts and making them more universal. So for example, even if you normally blog about writing, it helps if you can extend the theme of your post to something that non-writers can also relate to (such as perseverance), Another thing that might help is to frame your blog post in a way that relates to the theme of your blog. For example, if you want to write a post about a musical artist you like, you could talk about how you also like to listen to the artist when you’re writing. Hope that helps!